The Humax DTR-T2000 is the latest YouView PVR from set top box specialists Humax. Smaller than the brand's DTR-T1010 offerings, it employs a 500GB drive, enough to store 125 hours of HD or 300 hours of standard def, and sells for a competitive £199. YouView boxes are big carrots for ISP giants BT and TalkTalk, but sales of standalone boxes remain slow. Can this new edition find a more appreciative audience? Naturally this box performs all the usual PVR tricks, such as series linking and recommendations, deep search and filtering. You can record two programmes simultaneously, while watching a third from your recorded content library or On Demand service. There's freshly baked silicon onboard too, so navigation is fast and responsiveness high. It also integrates well with smartphones using the YouView app. Cosmetically this Humax is quite the looker. It's a compact 360mm wide and neatly finished in modernistic faux-silver. Connectivity includes a standard aerial loopthrough, HDMI, optical digital audio output, Ethernet, plus legacy Scart and phono AV inputs. There's no integrated Wi-Fi though. It's bundled with the standard Humax YouView remote control with defiantly clicky OK wheel. The fascia has a pull down flap hiding a USB slot, although this seemingly can only be used to charge mobile devices. The YouView platform sits atop the Freeview HD service and offers a seamless mix of over the air channels (70 now, with a decent peppering of HD) and Internet delivered catch-up. In addition to the mainstream BBC, ITV, 4oD and Channel 5 players, it offers UKTV (aka Dave, Really and Yesterday), milkshake!, S4C and STV in Scotland, plus non-contract Video on Demand from Now TV and Sky Store. The user experience itself is more polished than a Baby Grand. YouView's set-up routine is effortless and all the menu options, presented as an overlay of live channel footage, are entirely intuitive. Recorded image quality is transparent to source. Timeshift from the BBC's hi-def channels, and you'll get images as crisp as kettle chips; TruTV not so much. The PVR is also compatible with Dolby Digital 5.1 audio, when broadcast. Streaming services work well and for the most part don't disgrace themselves in terms of image quality. We experienced no buffering issues, but then we were using a fast fibre broadband. In truth, most PVRs are uniformly good when it comes to AV quality. The real differentiator is the user experience, and here YouView has it nailed. Combining the approachability of Sky with the sophistication of Freetime, the platform arguably pips both. 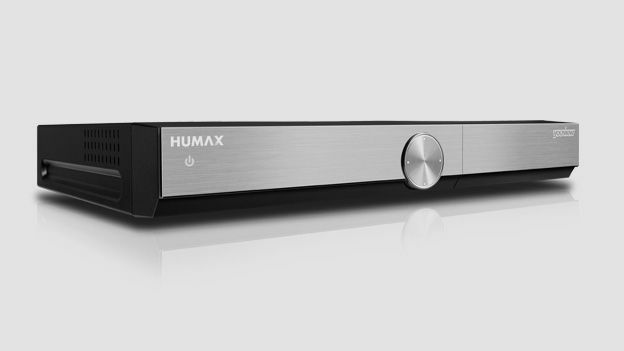 We rate the Humax DVR-T2000 as a winning refresh of Humax's PVR fleet. It's nippy on the corners, quiet at full throttle and a joy to drive. That 500GB hard drive may seem a little on the small side, but with a full library of catch-up and VoD on tap, you're almost certainly not be recording quite as much as you would have done pre-iPlayer. The only real caveat is the lack of integrated Wi-Fi; you'll need a wired network connection to the box, either direct from your broadband router or switch, or via a Powerline adaptor. Overall, this YouView box is a bit of a cracker.